Branson City Leaders passed the bill to takeover Factory Merchants Mall as described below. A volunteer effort staged to educate Branson City hall on the virtues and value of commercial real estate yielded a net gain in negotiations with Branson's mayor and alderpeople. Tonight, Tuesday Dec. 27, a contract will be presented during a special meeting to expedite a transfer of property from Factory Merchants Mall owners to the city with $300,000 at closing. The city had initially planned to release Simon Properties from a contract with 9 years before a contract with the city expired. Simon Property Group provides $129,000 annually for use of the land Factory Merchant's Outlet is built on. Branson Mayor Raeanne Presley publicly offered to socialize the property for purposes of a new park under protest from Branson's economic conservatives. The city's official stance rapidly changed when local officials learned accepting the offer would immediately require an additional $84,000 annually in insurance fees alone while details of socialization are being worked out including payment to contractors which must be approved through a slow bureaucratic process. The city is currently hosting a wave of contracts on W. 76 Blvd. where notable multillion dollar generating tourist venues such as HFE (Herschend Family Entertainment)'s White Water and Mickey Gilley's theater host buildings uner long term contracts. The Factory Outlet Merchant's aka Red Roof Mall has has an estimated value of $6,400,000. In 2010 the property was assessed at $11,812,000 before the Taney County Assessor James Strahan's office was ordered to drop the estimated value through a Taney County Board of Equalization decision. Property tax for commercial property is assessed at 32% of real value with 70% going to school district funding. Value is determined in Missouri by County Assessors using the "Honeycomb Appraisal Process" and under normal circumstances is a calculation of what the building would cost to build at current construction rates minus depreciation. Appeals generally include comparable valuation and/or operating cost calculations considering cash flow into the formula. The Factory Outlet Mall, if the city plans what appears to be an eminent takeover, will eliminate a tax liability of $101,244 ; $70,000 of which would take directly from Branson's School District. To further complicate the matter Simon Property also manages the TIFF (Tax Increment Financed) Branson Meadows property. Branson Meadows is a poor performer when considering the economic success of the Branson Landing and Branson Hill's TIF cash cows. Simon is attempting to transfer tenants to the Branson Meadows. While there may be an apparent conflict of interest; the contract proposed this evening includes a six-month management agreement with Simon to help the existing tenants find new locations. If all tenants moved to the TIF district, the city would forfeit an additional $180,000 annually in sales tax. City officials have signaled they intend to rush the contract through an alternative process rushing a first reading tonight at Branso Council Chambers of Branson City Hall, 110 West Maddux and the mandatory second reading Thus Thursday Dec. 29th at the same location. A Mexican standoff stalled City of Branson officials last night during a public meeting that went into private session closed to the public. The complexity of the arguments presented by real estate professionals, tenants and public leaders afforded city leaders reason to take a break before a decision can be made on a contract offering a voluntary public takeover by the City of Branson..
began at 6:20 p.m. in the Council Chambers of Branson City Hall, 110 West Maddux. The current operator of Factory Merchants Branson, Simon Property Group, wants to discontinue management and transfer ownership of the building, commonly known as the Red Roof Mall, to the city of Branson by the first of the year. The property is located on 32 acres of land owned by the city and leased to Simon Property Group. Shoppes at Branson Meadows, which is also owned by Simon. The terms of agreement, liability to the City, value of the property and long term value is being considered. Currently, under an existing contract, Simon Property Group owes $1.3 million to the city over the next 9 years. The city backed off their impulse position of immediate socialization for purposes of the park. New York's Sun, and the quick response was printed as an unsigned editorial Sept. 21, 1897. The work of veteran newsman Francis Pharcellus Church has since become history's most reprinted newspaper editorial, appearing in part or whole in dozens of languages in books, movies, and other editorials, and on posters and stamps. It is rather explicit from the Branson Police Department records that Kirby was detained on the 30th of August 2011 for 1. Driving While Intoxicated 2. Possession of Opium or an analog (similiar compound) 3. No insurance for the vehicle Kirby was driving at the time the incident occurred. Why Haven't Local Media Outlets Reported the Story ? In an unusual move Branson held the weeks arrest report from the press. Local news outlets have still failed to report the story unlike other similar incidents prior to Mayor Raeanne Presley taking office. In 2003 when Kirby Van Burch was accused of assaulting a police officer, drunk driving (took out a few signs), and fleeing the scene of an accident, a Branson Police Department press release was issued. In this case, the incident was actively covered up. After formal request the Branson Police Department responded in a courteous and efficient manner. The request was found nearly a month after the discovery when it was immediately posted. At the time, Branson's prosecuting attorney hadn't passed the information to the county. Under a new Missouri law municipalities are required to send second offense DUI's to the Circuit Court. This prevents persistent drunk driving offendors from evading charges due to a municipal relationship. The case is currently being reviewed by the prosecutor. If Ameica has Judeo-Christian roots it is clearest in the declaration that all men are created equal and thus deserve equal treatment under the law. But while our Mayor has yet to recuse herself from negotiating contracts with entities she has a conflicting fiduciary relationship with; allowing marketing and lobbying partners alternative treatment when they commit crime is a form of witchcraft Branson can do without. I'm forcing myself to rewrite this piece in a simpler, gentler fashion, and it's not because my editor is writing nasty colored notes below . I believe Branson residents have reason to be concerned with the breadth of ethical violtions that have occured under Branson municipal leadership. It is with sadness that Missouri leadership deems us merely out-state affording less protection to Branson than the more populated thus vote coveted districts to the north. Ethical and Sunshine Law (open government) violations have become such commonplace occurrence under Branson Missouri's Mayor Raeanne Presley's guidance that such statements of fact no longer wield shock. To speak of our leadership as corrupt is no more profound than to state chocolate is brown. Though the color is without controversy the flavor leaves no sweet aftertaste. With the passing of time our situation seems to be worsening. I ponder to what degree of crime is allowed to occur unabated with the current cast of characters. My fear grows stronger with every count of randomly discovered malfeasance. I wonder if our children our safe from the worst predators be the aggressor a business partner of our mayor. An incident with a recent entertainer and Presley lobbying partner inspired this frightful notion. It is a constitutional imperative, both federal and within the state of Missouri, that prisoner rosters remain available. The reason this is so important is to ensure that a government body doesn't kidnap a citizen and deny due process. We the people have the right to know who we are holding. Even our local press has become compliant. We have leadership ripe and willing to carry canned messages but little to verify fact and conduct research. Though it's my belief that such studiousness to verify fact divides journalism from mere scribble, in the end its every citizens right to access and check their own governmental body's work. When it comes time to socialize private property Presley's budget overfloweth. No expense is too little to buy land adjacent to a business partner or Presley's alma mater. We never read, "Mayor Ignores Conflict of Interest Sits on Board Recieving No-Bid Contract From City". Curiously, we never hear, "Crooked Mayor Calls State Officials To Block Low Income Housing Initiative Funding - State Officials Ignore ". Or of late, "Project Pitched as Funded By Grant Eyes $8.3 million expense and New Taxes". And yet, all of these headlines are accurate. Local press is very happy to regurgitate provably false information to such an extent that a new public relations director for the city may be sidelined. After all, if local reporters will print whatever a corrupt politician wants to publish (true or false) why pay for someone to answer with integrity ? After the supposedly broke city miraculously uncovered enough tax money to purchase a high school we were told a grant would cover the cost of a project to restore the high school. While there is a great deal of interest in re-vitalizing the old Branson High School, shouldn't local architectural firms have the opportunity to pitch the project ? Normally, when government is abiding by law and attempting to act honorably, projects are bid through an Request For Proposal (RFP) Process. Competing companies enter proposals into the marketplace of ideas at their own expense in the hopes of winning a contract. The cost to the public is free. Engineering firms invest time and money in hopes of outperforming other entities. Companies generate competing proposals and provide multiple options for the community to chose from. Instead of "free" , we were offered a free $5,000 coupon as long as we spent $5,000 to purchase a product that is available for free. The difference is, local companies were not allowed to compete. The recommendation from the Sustainable Design Assesmet Team (SDAT) paid for through the grant (wink wink) is to spend much more money. Just to get the engineering team to Branson taxpayers were forced to pay $5,000 to fly no-bid contractors to Branson under the premise of a grant. Furthermore, while the articles regurgitated by the Branson Daily Independent and Branson Daily News suggest the project will be funded through a grant, we now learn that nothing is further from the truth. The team hired by Presley, consulted with outside of the public eye and promoted through the guarantee of free service says the basic cost of the project will be $8.3 million. But Presley has already worked on a plan to finance the project. A no-bid contract could be funded through a new tax. Presley's charter city initiative , (which in its current form ignores community values) could include a real estate transfer tax. The new tax is a "real estate transfer tax." The tax would have to be paid in order to legally buy or sell property in Branson. The fiscal irresponsibility which has yet to be examined by either press or public since Presley took office will undoubtedly result in new taxes already. While the $75 million annual warchest Branson taxpayers give to Presley (and has been exceeded 5 years running) may be free to Presley it isn't free to Branson residents. But it's understandable why Presley would think its free money. While our hospitals are now denying services to the poor ($45 upfront expense required) , Presley gets free medical insurance from city tax income. Integrity free Press releases are regularly printed free of review. And Presley's squandering of public funds for personal gain have been left unchecked for too long free from the eyes of those who pay the bill completely free of public review. Much worse is the inevitable suffering that occurs when civic leaders hot for new positions of power lead free of public interest. His newest production, Happily Ever Laughter, builds on his critically acclaimed one-man Broadway show, about whichThe New York Times said, "His Broadway show is splendidly funny, and a generous display of warmhearted, high-quality humor." His longevity in Branson has given him a chance to evolve as an entertainer, writer and producer but Smirnoff relishes the opportunity to get back to his comedic roots. Innovative and funny standup comedy that reveals how to sustain love and laughter in relationships is supported with knowledge from his master's degree in psychology. Though he is celebrating his 20thand his last full season performing the Yakov LIVE!production, Smirnoff will continue to produce world-class entertainment for his Branson theatre. He recently announced the five-year run of a brand new show that was designed especially for Branson calledBrady Brunch with Barry Williams, the real Greg Brady from the 1970's hit television show The Brady Bunch. "Actor, Barry Williams, who portrayed Greg Brady in America's best-loved television series The Brady Bunch, is a fantastic entertainer" said Smirnoff. "It's a privilege to produce his Branson multimedia variety show. I love Branson! It's a great place to live. I've been here for 19 years, and I never lock my car. 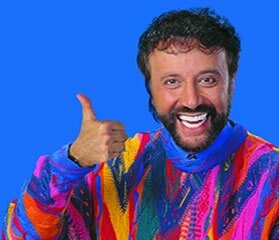 I don't know where it is..."
America's favorite Russian comedian, Yakov Smirnoff has been a mainstay in the entertainment scene since the late 1970s. By the mid 1980s he had several films and television appearances under his belt, joining the ranks of icons Robin Williams and Tom Hanks. After performing in his own 2,000 seat Branson, MO theatre for years, in 2003 he landed on Broadway performing in his critically acclaimed, one-man show As Long As We Both Shall Laugh. In addition to his standup comedy, television, film and stage success, he has written several books, recorded CDs, DVDs, and is a talented artist. In 2006, Smirnoff received his master's degree in psychology from the Ivy-League University of Pennsylvania. While performing more than 200 shows per yea r at his Branson theatre, he also speaks to business groups, presents seminars, is a published columnist for national magazines, and is a professor teaching classes about the relationship of Love and Laughter at Missouri State University and Drury University. He's taking his Happily Ever Laughter show on the road where audiences across America will see that you can live Happily Ever Laughter and laugh your Yak-off! Multiple efforts are underway to liberate Taney County from state law. Two terms for the same principal and three competing proposals have been floating for the last decade to reshape local politics and governments form and role in the community. The two terms describing the new structure is called "Home Rule" by supporters and "Charter Government" by the Missouri Constitution. They describe a system where locals determine a new set of laws by which the state government and by association, state guidelines submit to "Charter" standards. The process involves throwing out current county organization established by the state and a proposal which will go before voters to determine a yes / no answer to forming the new set of laws known which will be known as the Charter. A Charter government would reform government management, number function and pay of elected officials and likely the creation of new taxing categories. Missouri is hyperlocal. Missouri has 115 counties and a population of 5,987,580. The disparity of population per county makes Missouri residents in close proximity of government leaders with a very low ration of citizens to county officials. In fact, it is so great a differential between other states that it requires some examination. In contrast to Missouri's 115 counties, California has 58 Counties. If we deduct population of Missouri's four charter Counties which are Jackson, St. Louis, St. Charles and Jefferson the ratio of County to citizen is 32,763. California by contrast has a 637,270 citizen to county average, a ratio 19 larger than Missouri. Charters and constitutions are difficult to change once enacted requiring competing factions to create supermajorities to alter. The expense and cooperation required to update a constitution leaves some laws, according to "Home Rule" advocates outdated. Opponents of charter counties worry that government leaders can expand their power into areas they should refrain from interfering with. Taney County is a first class county. Only first class counties can qualify for charter status leaving 16 possible charters in Missouri .The state changed the requirements for a first class county this year which is determined by total valuation within county borders.Total property valuation moved from $600,000,000 to $900,000,000 in order for a county to be considered first class by the state. Creation of a charter city for Branson, MO and creation of a charter county have former political bedfellows with opposing political agendas. The two notable forces are those of Taney County Commissioner Ron Houseman and Branson Mayor Raeanne Presley. Both have been quietly supporting the idea for several years. For Houseman, the issue was raised during public meetings. Presley's been quieter on the subject publicly but has spend in excess of $750,000 in political surveys. The third option is the possibility of a new county. This county could encompass the small geographic area in Stone County that derives its primary income from tourism extending westward. The numbers would allow for Vacation County Missouri to conduct a tourism agenda without outside influence. "The government has to be prepared to say no to certain things and concentrate on what it's supposed to do," said Ortwerth, a Republican who served as county executive for 12 years and is now executive director of the Missouri Family Policy Council, a Christian lobbying group.